She is the Tabernacle where God became a Child. She is the great miracle of God's Mighty Arm. "Do not be afraid to love the Blessed Virgin too much. You can never love her enough. 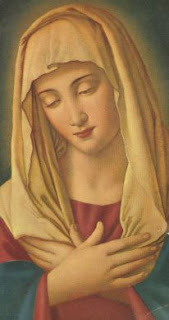 And Jesus will be very happy, because the Blessed Virgin is His Mother." - Saint Therese of Lisieux. Mary the grape,Christ the Sacred Wine! Mary the cup, Chirst the Saving Blood! "Always and in all circumstances, yield the first place to to hers; especially during recreation listen quietly, without interrupting, even if someone tells me the same thing ten times. I will never ask questions about something that interests me very much." Resolution: still the same; namely, to unite myself with the Merciful Christ. General resolution: interior calm, silence. Hide me, Jesus, in the depths of Your mercy, and then let my neighbor judge me as he pleases. I must never speak of my own experiences. In suffering, I must seek relief in prayers. I want to thank my friend Josephine for sharing this article. ...Martin said she is also concerned about couples with infertility problems. “Most infertile couples are never properly diagnosed. They are simply told their best chance of having a baby is in vitro fertilization (IVF). IVF is not only prohibitively expensive, very invasive, and not covered by most insurances, but it is also morally suspect,” she said. Because of her Catholic faith teaching, Martin does not believe that physicians should insert themselves into the creative act. She believes that is exactly “what doctors do when they separate the marital act from fertilization by IVF and other assisted reproductive technology (ART). I respect the marital act. I’m not going to intrude on that,” she said. Christ made me understand that I could save souls through the cross. The greater the crosses I encountered, the more ardent became my desire to endure them. God has made human beings so noble that every suffering which purifies us and every effort which raises us up gladdens us while making us better. medicine for salvation, not a punishment for damnation. When you are scorned by others and lashed by God, do not despair. God lashes us in this life to shield us from the eternal lash in the next. The desire to receive God's treasures and favors is universal. But how few people aspire to wear themselves out and to suffer for the Son of God! If we suffer with Christ, we will be glorified with Him. The fulfillment of the promised happiness is certain for those who share in the Lord's Passion. Let us strive to face suffering with Christian courage. Then all difficulties will vanish and pain itself will become transformed into joy. Such is the nature of faith that the greater are the obstacles it encounters, the more ardent it becomes. 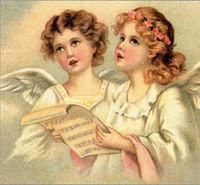 Do not allow yourselves to be overly saddened by the unfortunate accidents of this world. You are not aware of the benefits they bring and by what secret judgment of God they are arranged for the eternal joy of the Elect. The smallest of life's events are directed by the Lord. Creatures are instruments, but it is the hand of Jesus that directs all. 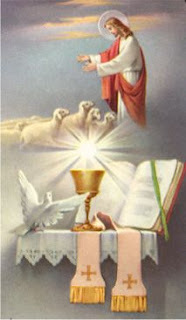 The Eucharist may be termed a perpetual Calvary. Without it how many times God's wrath would have erupted on our heads! Suffering out of love for God is a signal favor, but we do not realize this. For we thank God for prosperity and take no heed that afflictions would be a much greater grace. The cross is the greatest gift God could bestow on His Elect on earth. There is nothing so necessary, so beneficial, so sweet, or so glorious as to suffer something for Jesus. If you suffer as you ought, the cross will become a precious yoke that Jesus will carry with you. Suffering is like a kiss that Jesus hanging from the cross bestows on persons whom He loves in a special way. Because of this love He wants to associate them in the work of the redemption. Let us lose nothing of what God bestows on us. Difficulties and sufferings will disappear, but the merit we acquire through our fidelity will remain forever. Let us therefore build our eternity through all the things that pass away. To suffer and not to suffer for God is torment. 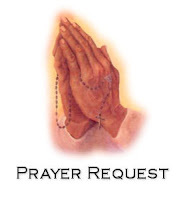 During mental prayer it is well, at times, to imagine that many insults and injuries are being heaped upon us, that misfortunes have befallen us, and then strive to train our heart to forgive and bear these things patiently, in imitation of our Savior. This is the way to acquire a strong spirit. Remember how the crown was attained by those whose sufferings gave new radiance to their faith. The whole company of saints bears witness to the unfailing truth that without genuine effort no one wins the crown. Visit her site by CLICKING HERE for the scripture references. "There is no greater love than this: to lay down one's life for one's friends." Hawaii is proud to claim Father Joseph de Veuster or Damien or Kamiano, as one of our very own saints (or soon-to-be canonized) along with Blessed Mother Marianne Cope. By now the world knows about this young man from Belgium who came to Hawaii, taking his sick brother place. Once here he was ordained a priest of the Sacred Heart Fathers. 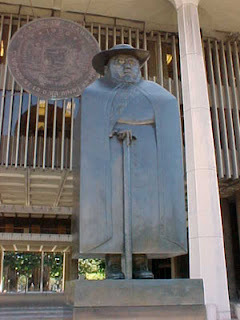 He was actually ordained at our Cathedral in downtown Honolulu. He volunteered to go to a remote part of Molokai where the people infected with the dreaded "Leprosy" bacteria...Hansen's disease... were forced to go. He arrived in a place where the inhabitants greeted him with ""Aole kanawai ma reia wahi" -- "In this place there is no law" ..."
He soon made it a decent place to live. He built a church and a home for children. He made it a home for the people who felt abandoned by society, separated from their families by force, and actually gave them hope. 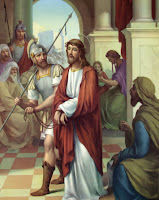 He had to fight for supplies and other necessities. He humbly confessed his sins by shouting them to the priest on the ship because he wasn't permitted on board. Soon after, he contracted the dreaded disease himself. He gave up his life for the love of his neighbor. Even after death, he was viciously attacked by a Reverend Hyde, who accused him of all sorts of indiscretions as an explanation for him contracting Hansen's Disease. To read more about Father Damien, I would recommend Damien the Leper by John Farrow, or watch the movie Molokai, the Story of Father Damien, starring David Wenham of the Lord of the Rings fame. 1. Create great holiness and become a powerful witness to those around you. 2. By accepting your pain you are doing God's Will in an awesome way. 3. By offering your pain to God, you can save souls. God is trusting you with pain; He is trusting you to accept it with love. 1. Preventive Suffering - Where God uses suffering as a way to prevent us from "committing sin or making errors in judgment or becoming to worldly or proud". 2. Corrective Suffering - The sufferings incurred by our disobedience can be used to purify the very weaknesses that produced the sin in the first place. 3. Repentant Suffering - This kind of suffering "cleanses our souls and brings down upon us the compassion of God and enables us to begin anew". The following was written by Sister Faustina following the previous entry of the Chasms of Hell. 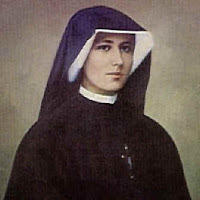 "I, Sister Faustina, by the order of God, have visited the abysses of hell so that I might tell souls about it and testify to its existence. I cannot speak about it now; but I have received a command from God to leave it in writing. The devils were full of hatred for me, but they had to obey me at the command of God. What I have written is but a pale shadow of the things I saw. But I noticed one thing: that most of the souls there are those who disbelieved that there is hell. When I came to, I could hardly recover from the fright. How terribly souls suffer there! Consequently, I pray even more fervently for the conversion of sinners. I incessantly plead God's mercy upon them. O my Jesus, I would rather be in agony until the end of the world, amidst the greatest sufferings, than offend You by the least sin." 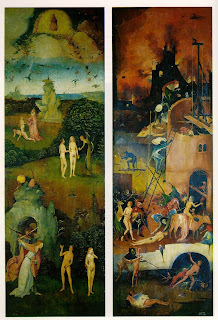 A painting by Hieronymous Bosch, c.1510, portraying Hell on the right. Seventh torture - is horrible despair, hatred of God, vile words, curses and blasphemies. These are the tortures suffered by all the damned together, but that is not the end of the sufferings. There are special tortures destined for particular souls. These are the torments of the senses. Each soul undergoes terrible and indescribable sufferings, related to the manner in which it has sinned. There are caverns and pits of torture where one form of agony differs from another...Let the sinner know that he will e tortured throughout all eternity, in those senses which he made use of to sin. I am writing this at the command of God, so that no soul may find an excuse by saying there is no hell, or that nobody has ever been t here, and so no one an say what it is like." 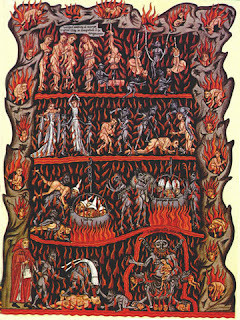 This one is a medieval painting depicting Hell. "Faithful submission to the will of God, always and everywhere, in all events and circumstances of life, gives great glory to God. 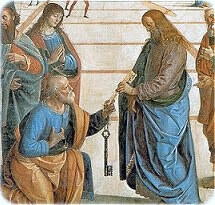 Such submission to the will of God carries more weight with Him than long fasts, mortifications and the most severe penances. Oh, how great is the reward for one act of loving submission to the will of God! As i write, my soul is enraptured at the though of how much God loves it and of the peace that my soul already enjoys, here on earth..."
1-800-Flower has a message center set up at their website. 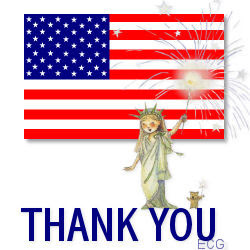 Please send a message to our troops and thank them. We do not very often come across opportunities for exercising strength, magnanimity, or magnificence; but gentleness, temperance, modesty, and humility, are graces which ought to color everything we do. There may be virtues of a more exalted mold, but... these are the most continually called for in daily life. If there be a true way that leads to the Everlasting Kingdom, it is most certainly that of suffering, patiently endured. 1. 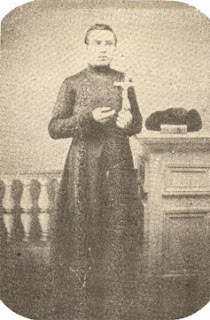 Bill Peffley, Fr. Peffley's Dad who will be undergoing quadruple by-pass surgery today. Click Here for details. 2. For Nathan, the nephew of former Hawaii Right to Life Director John Long who recently underwent serious surgery for cancer. 3. For Ernesto, a fellow parishioner who recently underwent cataract surgery for a second time and for other health issues. 4. For Phillip, a friend undergoing cancer treatment. 5. For the children of the world. May God and His blessed Mother protect them from all dangers. If you want God to hear your prayers, hear the voice of the poor. If you wish God to anticipate your wants, provide those of the needy without waiting for them to ask you. Especially anticipate the needs of those who are ashamed to beg. To make them ask for alms is to make them buy it. Out of the 242 folks who voted in the Real Presence Poll, 7 voted that they did not know what the Real Presence was. 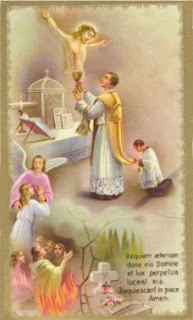 Very basically, I would like to say that at the Consecration of the Mass, the ordinary bread and wine, are changed by the Priest (and only by a priest can this be accomplished), into the ACTUAL Body and Blood of our Lord Jesus Christ. Notice that I do not say, "we Catholic believe this" because, whether or not you believe in this miraculous transubstantiation, it is a fact and it occurs nevertheless. It was at the last supper that our Lord celebrated the First Mass and it was there that the priesthood was initiated as a way to perpetuate the Eucharist or Real Presence by the priest. 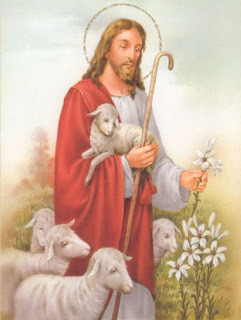 Now, for a more in depth study of what the Real Presence is, click CLICK HERE to read what the late Father John A. Hardon, S.J. has written.